In the eighth month of pregnancy, Gudiya has literally become a specimen for the public to ogle at. She is now living with her first husband – a soldier who disappeared five years ago after the Kargil conflict and returned home last month. Lying on a cot in the courtyard of the house of Sapper Mohammad Arif, Gudiya is surrounded by some 50 women from the neighbourhood. An equal number of men are gathered in the doorway to the house. Arif is busy attending to phone calls from journalists, friends and relatives. Women discuss Gudiya's future as she watches helplessly. People come, look at her, and leave. Journalists and cameramen flashing their gadgets are part of the audience. Gudiya has been under the 'protection' of these village folk ever since she was brought here last Saturday. When I visited her on Wednesday at her in-laws' place in Mundali village in Meerut district of Uttar Pradesh – about 75km from Delhi – she looked fragile, tired, almost broken. She could not speak properly though the fever that had gripped her for about a fortnight had subsided. Just a day before, Zee News, a satellite television channel, had organised a 'mock panchayat [council of elders]' to discuss the dispute. Gudiya said in the television studio, "I want to go with Arif." The statement decided her fate. Islamic scholars present in the audience applauded her decision, proclaiming it to be in accord with the Shariat (Islamic jurisprudence). The second marriage, they claimed, was illegal. Her second husband, Taufeeq, was taken aback and could not say anything. Arif went on to announce that he would take care of Taufeeq's unborn child. The controversy arose when Arif, who was held by the Pakistan Army as a prisoner of war, returned to India on August 9. He had disappeared from the Drass sector in Jammu and Kashmir while sweeping mines along the Line of Control on September 16, 1999. Gudiya married distant relative Taufeeq on April 20, 2003. They have known each other since childhood. Their marriage was arranged by their parents because there was no news about Arif, who had by then been declared a deserter by the army. Arif's family had also supported Gudiya's remarriage. After all, she and Arif had been married for barely 10 days before he was recalled to the front. But her peace was shattered when it was discovered that Arif was no deserter, but had been taken prisoner by the Pakistanis. Last month, the Pakistanis finally released Arif and he returned home to a warm welcome. 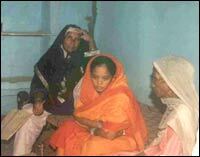 Gudiya was then living with her parents in Kalunda village on the outskirts of Delhi. On Tuesday, Arif, Taufeeq, Gudiya, and their relatives were brought to the television studio. Islamic scholars and clerics, including Maulana Wahiduddin, were part of the discussion. The debate ended with Gudiya going back to Arif. It was for the first time in the history of Indian television that a personal issue had been debated and decided on television. But newspapers criticised the event. A headline in The Indian Express screamed: Gudiya's personal trauma, nightmare paraded in public on TV horror show. An investigation by rediff.com revealed how Gudiya was forced to make her choice. When Arif crossed the border and reached Wagah, it was reported widely in the print and electronic media. It was also reported that Arif's wife Gudiya had married Taufeeq. So, what would Arif do now? The legality of her second marriage was also questioned. According to the Shariat, a Muslim woman cannot marry another man as long as her husband is alive and has not divorced her. In the case of the husband disappearing, the woman needs to wait for four years and then ask for a decree from the local qazi (religious head and expert on Shariat) nullifying her marriage. Gudiya had not nullified her previous marriage before marrying Taufeeq. So the experts said her second marriage was illegal and the child born to her and Taufeeq would be termed illegitimate. As the debate heated up in the media, Gudiya became nervous. She had to be admitted to hospital for a few days owing to high fever. At that point she told reporters that she had left the past behind and only loved Taufeeq now. "I am not a cow or a buffalo that I can be sent away just like that," she had remarked. Currently living in Mundali village with Arif, she has not yet recovered from the trauma. Left in a corner of the courtyard, she lay on the cot with her eyes closed, unwilling to speak to anyone. She looked like a stranger in her own house. When I addressed her as "apa" (elder sister), she reciprocated with a smile. Offering a seat next to her, she explained her sordid tale, her voice choking, fumbling over every sentence. Gudiya said, "When it was reported in the newspapers, the maulana [cleric] spoke to me. I was then living with my parents in Kalunda [near Delhi]." Her second husband Taufeeq had left her there for the delivery. "My father didn't tell me anything initially. But then everybody started telling me to go to Arif. My father also joined them. It was according to the Hadith [the Prophet's sayings]. I had to go to Arif." Asked if it was her decision to go back to Arif, she said, "It was everybody's decision", then burst into tears. Her voice choked and she hid her face in her dupatta. The women around looked on with surprise. Gudiya sensed it and controlled herself. A woman from the crowd shouted, "Don't show your tears. Smile. Make your face look good." She followed the instructions. But she revealed in private that her father took her to her aunt's village, Naurangabad, in Meerut district last Friday. This, despite Gudiya being in an advanced stage of pregnancy. Here, a panchayat was called, which was attended by people from the villages of Mundali and Naurangabad. Arif, his elder brother, and relatives were also present. Clerics from nearby mosques and seminaries joined in. In all, nearly 1,500 people had gathered. But neither her second husband Taufeeq nor his parents were informed about the meeting. She last spoke to Taufeeq five days ago. The panchayat in Naurangabad gave the verdict that Gudiya should go back to Arif as her second marriage was null and void. Asked if she was pressured by the panchayat to accept Arif, she maintained silence. After a lot of hesitation, she said, "It was everybody's wish. The Hadith enjoins it." Earlier, Arif told rediff.com: "The panchayat decided that she should go with me. It was according to the Shariat. The panchayat also asked me to talk to her alone. I asked her what she wanted. She frankly told me that she wanted to come with me. She said her father had forcibly married her to Taufeeq." Asked about this, Gudiya remained silent. She had only one thing to say, which she repeated, "It was everybody's wish." After the decision was announced in the panchayat, Arif took Gudiya home to Mundali. All this happened without Taufeeq being even informed. Riyasat Ali, who witnessed the panchayat in Naurangabad, said, "She was pressured by the people there. She was not allowed to speak. The clerics told her that she had to follow the Shariat and go to Arif. They said her son would become illegitimate if she did not. "She was left with no option. Can a woman express herself in front of so many men?" Ali is Gudiya's uncle and a relative of Taufeeq. He had proposed her marriage to Taufeeq. Three days after this incident, Arif was invited to a felicitation ceremony in New Delhi on Monday. Here, a Zee News reporter asked him to come to the studio for an interview, to which he agreed. Another reporter from the same channel brought his brother and Gudiya from Meerut to the studio for the interview. Taufeeq told rediff.com, "The MLA of my area told me that he was taking me to his house in NOIDA. But he took me to the television studio. I didn't know anything about it. I saw that the religious scholars were also there. The discussion started all of a sudden. I didn't know how to react. I was quite upset. "When Gudiya said she wanted to go with Arif, I was out of my mind. I stopped thinking. I don't know what happened after that. I became senseless. "But I am sure she was pressured. I didn't get time to speak. She also could not express herself. There was a women's group. They wanted to speak to her alone. But the TV guys didn't allow it. Finally the decision was taken and we all returned home. When the clerics gave their verdict, what could I do? The TV people cheated me. This is not the way to settle disputes." Taufeeq said Gudiya had spoken to her on telephone five days before this incident. She had explained to him the pressure she was being under. Her father had even threatened to commit suicide if she did not go back to Arif. The family forced her to go back to her first husband because the second marriage had been anti-Islam, he said. Moreover, when she had already been sent to live with Arif on Saturday, it was not possible for her to come back to him. "We celebrated like anything," said next-door neighbour Farasat Ali, pointing to the decorations in the doorway. "There was a huge procession of more than 2,000 people when Gudiya came here on Saturday. We danced and distributed sweets." Arif's elder brother summed up the mood in the village. "It was a matter of the pride of our village," he said. "Had there been no amicable solution, there would have been a bloodbath here." Sub: What the hell is this !